Writing essays made easy! 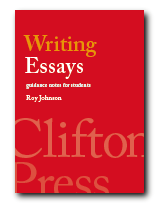 Improve your essay writing skills – from analysing questions and creating introductions to submitting finished essays. This eBook covers reports, dissertations, and term papers. Learn how to develop your English grammar, clarify your thinking, and plan your writing. The book includes five sample essays on current affairs, history, philosophy, sociology, and literary studies. PDF format can be used on laptops, mobiles, and workstations. You can add your own notes and live hyperlinks to personalise your eBook and make it more interactive. This is a full length book for the price of a cup of coffee. Analysing questions How to recognise key terms and instruction terms in the question(s) you have been asked to answer..
Case agreement How to create agreement between subjects and objects, and ensure consistency when using singulars and plurals. Categorising How to assess and organise the topics you are going to use in the construction of your essay plan. Colons The colon is used to introduce a list, or to separate two clauses. This shows how to do it. Conclusions A good conclusion should draw together and summarise all the arguments in your essay. Instructions An explanation of the terms commonly used in essay questions and instructions – and what they require from you in your answer(s). Reading How to decide how much reading and research are required for background information to an essay assignment. Relevance How to decide on the relevance of your arguments in relation to the question you have been asked to answer. Repetition How to avoid repeating the same names (people and places) and key words in an essay. 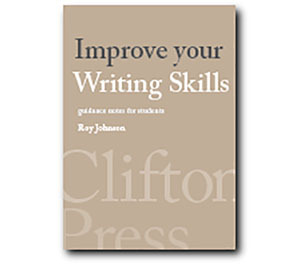 Style A plain and simple prose style will help you to avoid the problems of over-complicated writing. Titles How to show the titles of articles, journals, newspapers, magazines, films, and books in essays. Sample essays Four sample essays at different levels – on Government, Philosophy, Sociology, and Literary Studies. Reference Reviews of useful reference books for academic writing – with direct web links to Amazon.